Lou Reed’s “Transformer”, from 1972, was an odd album to be honest. 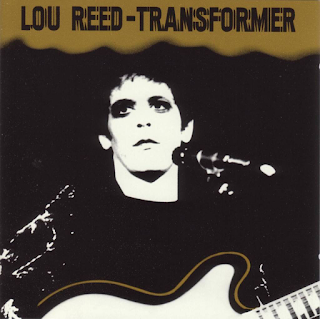 After The Velvet Underground had sort of drifted away at the end of the sixties, and nobody paid much attention to his debut album from earlier in the same year, it was time for Lou Reed’s solo career to be given a shot in the arm. The perceived mythology, similar to that which accompanies Mott The Hoople’s history, is that an ailing artist needed some help to break it big in the world of glam rock and there was only one person who could offer that - David Bowie. Personally, I am not convinced that either Mott or Reed went cap in hand to Bowie, begging for his all-knowing assistance. Bowie had only been acceptably successful himself for a few months, it must be stated. Anyway, whatever the motivations or true story behind it all, David Bowie and his band mate Mick Ronson produced the album and played on it, together with the far more than just competent bassman Herbie Flowers. Was it therefore, given Bowie’s influence, a “glam album”? In certain places, yes. Ronson aded some guitar riffery and Reed glammed it up on some of the tracks, thinking, I guess that this was the thing to in 1972. In many ways, he sounds a bit confused by it all, and certainly it was an album the like of which he never came up with again. His music moved in a different direction from then on. Nevertheless, it was a massive success and it still the album people talk about when they discuss Reed’s career as being his best. “Vicious” starts the album with a chainsaw cut of a riff from Mick Ronson, stabbing in alongside Reed’s laconic vocal. It sounded “glam” and sat well alongside RCA stable-mate “Ziggy Stardust” and Roxy Music’s first album. Some crazy guitar at the end of the song. “Andy’s Chest” presumably referred to Andy Warhol and it was a weird, laid-back track that features an lazy, almost whispered vocal Reed, before a crystal clear drum kicks in, a chugging rock rhythm and Lou starts going on about shaving off a bear’s “baby hairs”. All very odd. At fourteen I listened to this album and hadn’t got a clue about it. I still haven’t in many ways! It is clear, in later years, though, what a gay album it was. 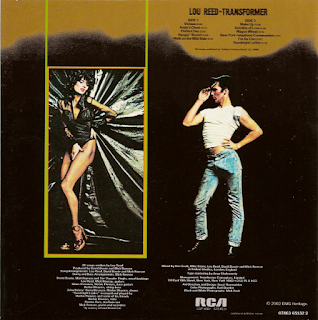 I didn’t even particularly get the references on “Walk On The Wild Side”, incredible at it may seem, or the pictures on the rear of the album (of a transgender model and Reed in a gay peak cap, hand on hip and bulge in jeans get-up). “Perfect Day” is a masterpiece of superbly orchestrated, atmospheric ambience that sees Reed talking about his perfect day that everyone can relate to, even if it was probably going on about drugs, or had a darker message in the “you’re going to reap just what you sow” fade out lyric. “Hangin’ Round” was another “Hang On To Yourself” glam pastiche. Reed rocks out on this one, far more than on most of the album. Some more intriguing, beguiling lyrics abound, as they do on all the album. The afore-mentioned “Walk On The Wild Side” is just wonderful, of course. Herbie Flowers’ magnificent, hypnotic, throbbing bass providing a sparse backing, together with some gently shuffling percussion. Reed’s tales of the often tragic characters from his days with Andy Warhol at his Factory Studio. Lyrics about transgender, giving head, drug taking and male prostitution seemed to completely slip through the Radio One censors’ net, incomprehensibly! Whatever, it is marvellous and takes right back to summer of 1973. What a record. Bowie is not on saxophone, as popularly thought, but Ronnie Ross. “Make Up” is a slow tuba backed number that has Reed telling his audience “we’re coming out of her closet” and telling of wearing make-up, with a decidedly effeminate vocal at times. Nobody caught on to this at all. Certainly not in my teenage circles, many of whom had this album. Bizarre. “Satellite Of Love” was the second hit single after “Wild Side” and tapped in to the Bowie/space travel thing. It has an addictive piano coda and an affecting vocal and backing vocals from Thunderthighs (who also backed up Mott The Hoople). The “bridge” bit about “Being bold with Harry, Mark and John on Tuesday, Wednesday, Thursday..” always mystified me - firstly, what a naughty girl/boy, secondly, why was that verse in it? It bore absolutely no relevance to the rest of the song. “Wagon Wheel” has a T.Rex-inspired “Get It On” riff. One of the most rocky numbers on the album. “New York Telephone Conversation” is a short, almost spoken waste of time, really. Very camp. Some probably love it. Sorry! Not for me. Thankfully it’s over pretty quickly. Another T.Rex “Slider” style riff introduces “I’m So Free”, complete with “Oooh Oooh” glammy back up vocals and a Beatles reference in the “I’m Mother Nature’s Son” lyric. “Goodnight Ladies” is a slowed-down, Berlin 1930s jazzy farewell. Some nice clarinet and New Orleans-style backing. Completely incongruous with the rest of what was a very incongruous album. As said, I never quite knew what to make of this album. All these years later, I still don’t.